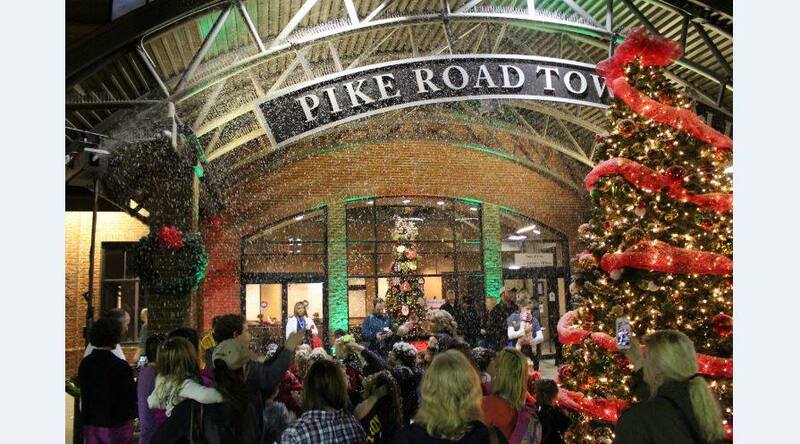 Join the Town of Pike Road at Town Hall on Friday, Nov. 30 at 5:30 p.m. for an evening of family-friendly fun at the Town Christmas Tree Lighting. This magical event will feature a Christmas story presented by Mayor Stone, carols from the Pike Road Schools Show Choir, hot chocolate, and even snow! Each year, the Christmas Tree Lighting helps the Town kick off the Season of Giving Holiday Collections Drive, which benefits the Food Pantry at Woodland United Methodist Church and the Central Alabama Veterans Health Care System. Follow this link for a list of items to donate, and bring them to Town Hall on Nov. 30 to make a difference in the lives of families and individuals in our community. The Town of Pike Road encourages you to bring donations to the Christmas Tree Lighting, but donations can also be dropped off at Town Hall on weekdays from 8 a.m. – 5 p.m. from Nov. 30 – noon on Dec. 19. You can also bring donations to our Dec. 17 episode of Mondays with the Mayor, which will be held from 12 – 1 p.m. at the Food Pantry at Woodland UMC. Holiday magic happens each year at the Christmas Tree Lighting! Will you be joining us? Follow this link to the Facebook event.